Recycling an old post from last summer for this week’s WW. Things are a little hectic for trainers this time of year & there are a lot of balls up in the air. Do you know the long term affects of what you put in your body every day? I’ve just begun studying for Precision Nutrition, a certification for trainers to become Sports Nutrition coaches. The early chapters talk about the basics of how your cells are structured, down to how the membranes of the cells themselves are affected by how & what you eat. Thinking about the body on this level drives home how little we know about the chemicals we put in our bodies every day and the way they interact with us on the most fundamental level. 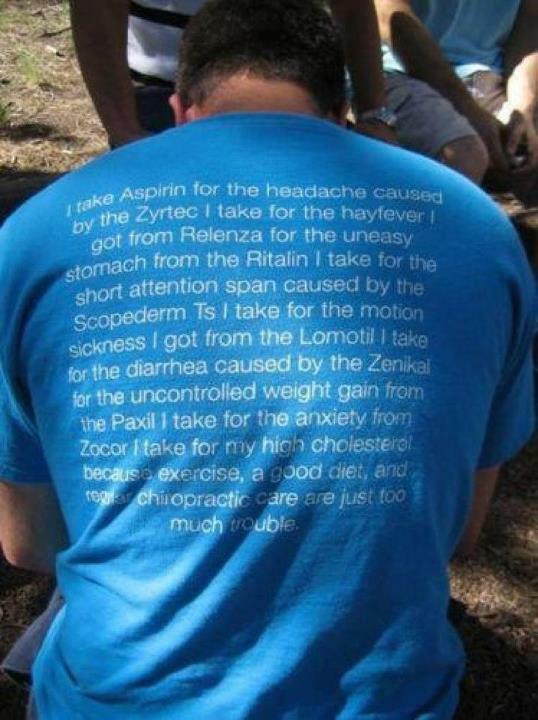 …because exercise, a good diet, and regular chiropractic care are just too much trouble. I hope you draw from this the idea that, instead of spending thousands over your lifetime on “living through chemistry” you could invest a few hundred dollars a month on good quality food and some appropriate running footwear (or a gym. or a trainer.) Seems a worthwhile investment to me. « UA5k Team – Week 3!